I can't really answer your first question. I don't THINK it would hurt it, but I really don't know for sure. I think you should be able to hook up the output of the Eumig to your computer's input. If there's only one, it's probably a split input that can be used for either mic or line in. It would either detect this on it's own, or your sound driver control panel would let you select mic/line in. You'd want to use line in. Is the output on the Eumig stereo or mono? You could either make a cable to get the single channel onto both channels of the computer....... or do it in software. Record the output to a single channel and then use a wave editor such as Audacity to mirror the track onto the second channel. It's a free download. You might have to fiddle with recording levels until you get something you like. Give it a shot. At worst, it doesn't work. Synchronizing, I have no idea what's out there to do that. None of my footage had sound. I just drop music files in to give it a sound track. I'm using Powerdirector 16. I can't remember if there's a sync option in there since I never had a need for it. By looking closer to my projector and to its spec, I found a line output in the form apparently of a 5 pin DIN male plug designed to connect the projector to an amplifier. I found on internet a lead made of a 5 pin DIN plug to a 3.5 mm jack stereo audio. May I connect directly this lead to the mike inlet, also a 3.5 mm jack female, of my computer? In the projector spec, it is written that they use the pins 2 and 3 only, I guess it means no stereo. I use Audacity (free) software to record the audio and export that as a wav file. Then I use video edit software to import the film scan and the audio file and then spend ages lining the two up to be in sync. It is possible, I have managed some short examples. It is fine to connect the headphone of a projector to the line in of a pc or laptop, just begin the the volume at around 1/3 while you set audacity recording and watch the record levels, increase the projector volume gently to get a good signal. Set audacity to record in mono in it's preferences, record the audio, as it will be mono, you will need to then copy and paste the recorded audio to a new track, in an indentical position under the original recording. To the left of the audacity tracks, there is a pan control, pan one track left, one track right, and 'export' the audio. The reason for copying audio to a new track is becuase if you don't you will only get audio from one speaker on your pc or laptop. Or you could use video edit software to make the audio appear on both left and right channels. I use san serif movieplus X6 for my simple edits. 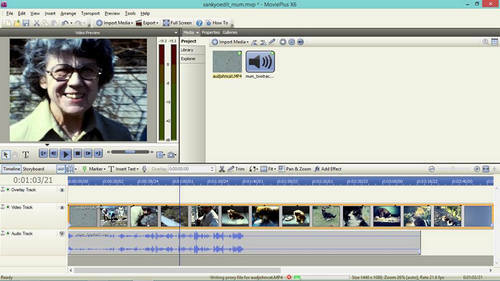 Its possible windows movie maker could do the job, but it won't be easy lining up the audio to picture in WMM as it is such a basic program with little chance of adjusting speed variations in your content. sound example, not quite perfect, You Tube Video. On another topic named "Record soundtrack ..." Berend De Meyer explained that he used the line output of his projector. Since I have one on mine (5 pin DIN) may I directly connect this output to the mike 3.5 mm jack input of my pc? BTW is it worthwhile to spend so much money(scanner) and effort(me) to digitize my movies by DIY rather then letting the job made by a lab? I have a very bad experience with my 6 first reels? They were digitized with the help of a camera aiming at a projector through a special lens. without doubt it is a lengthy time consuming process. the sound recording process is pretty straight forward if you understand audio software. You could by all means use the DIN output to the 3.5mm line in of the laptop, but I would consider there no difference in audio quality to the headphone socket. In my real life I connect with headphone sockets to large PA systems with ease. The only point to note, you say the 'mic' input, this is only designed for microphone level signals so a line input from either a DIN or headphone socket will distort considerably. If you have a number of sound reels, it might be better to pay a different lab to do the job for you if you have misgivings about recording and syncing your own material. I don't feel the need to purchase sony vegas or final cut for my little efforts. good luck, sorry i wouldn't know which lab to suggest for having sound movies transferred. If this 8mm sound project your aiming at will be worth the money and effort is of course up to you. Scanning the 8mm with the Somikon is rather straight forward, except for adjusting the frame rate. Recording the sound and syncing it will be your biggest quest - at least it is for me - and challenge. I had some recordings on one reel taken with 18 and 24 fps in-camera, so had a lot of switching to do. My experience is that - although silent 8mm is already a very time consuming task - getting the soundtracks recorded and synced is even a greater one. I see that Mike has given you some great advise and workflow to try. Good luck with yours. I own a somikon XL. I am struggling to understand why the compression artefacts are so severe. I read here and on the wolverine thread that some believe it is a MP4 compression issue, some instead a JPG compression problem of the single frames. I also read that extracting the card from the machine, before the video file is saved, will preserve the single frames of the scan and allow me to process them on a computer. Is this true? If somebody tried that approach do we know if the problem is with the JPG or MP4 compression? Thank you for the effort you have been making here to improve the firmware and get to the bottom of the issues with the wolverine and the somikon. 1, I've tried removing the card while in use. No sign of individual JPG images. 2, you will need to scan in "Low" sharpness mode to minimize compression artefacts. Note that it may NOT produce different images from that of the default Normal mode. (See my earlier post on this.) Then, you'll need to install the hacked Wolverine FW, which does indeed enable it (and has no "forgetting sharpness setting during power cycles" bugs). Today I unboxed the replacement Somikon I received in September 2017. It is shipped with FirmWare - 20170421-PL07-DE - so it's an update to my older Somikon's which held PL05. Of course I'm curious what changes were made here. Will do some more tests today with actual footage and keep you posted on the results. I noticed a horrible colorcast for the settings EV-1 and EV-2. For those who want some post-scanning color grading (white balanced) and cleaning the video output here an example I made with my latest Somikon HD-XL. Speaking of color casts, let me publish my experience on the aging of different color film stock. You may know the symptomps of the badly-aged stock: absolutely awful bluish cast everywhere. Kodachrome films age wonderfully. I've scanned a lot of Kodachrome II / Kodachrome IIA / Kodachrome KM etc. material; all exhibit an excellent color balance even after these years. The (currently) oldest material I have is a scan of Kodachrome II Std8 films from 1964 (the German army stuff at https://www.youtube.com/playlist?list=PL4_1cuziVtq-xA4BzygOWwI7cjPv9n4U0 ). So do very(!) old AGFA(German) material, including even late (produced in the 80's) ORWO (East-German) stock based on the very old AGFA technology. My earliest color AGFA scans are from 1955 and exhibit no color problems. (These color films have been already manufactured in East-Germany but with the original AGFA tech.) See for example https://www.youtube.com/watch?v=v84Wd0lMU44&list=PL4_1cuziVtq-5b38a1xM8NaHSV jZ1ipv4&index=2&t=1000 or https://www.youtube.com/watch?v=ID9aRrAOrdY&index=12&list=PL4_1cuziVtq-5b38a 1xM8NaHSVjZ1ipv4&t=600 . BTW, the entirely color film collection at https://www.youtube.com/watch?v=Tb2xad5Ezi4&index=14&list=PL4_1cuziVtq-5b38a1xM8Na HSVjZ1ipv4 also show the same stock a bit overexposed (this is why I used -0.5EV during capture) during the entire run if you want to know how it behaved in case of a typical user error. Note that, if you compare the resolution of these color films to the b/w ones in the same 1955 album ( https://www.youtube.com/playlist?list=PL4_1cuziVtq-5b38a1xM8NaHSVjZ1ipv4 ), you can easily see b/w films had definitely better resolution than these early color films. Werner Thank you so much for all your additional info's and footage shared. Much appreciated! 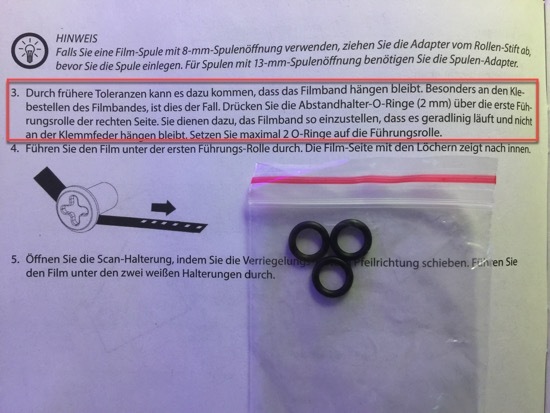 In the box of my latest shipment of the Somikon HD-XL I received a small plastic bag with three O-rings in it. As per the manual this is apparently to guide the film on the first glider on the right side of the scanner. One on each side of the film. I haven't used them so far, perhaps this is a possible solution for the Jumping Jack Flash symtoms of our scanners? Do the Wolverine/Reflecta ship with the same three O-rings? It seems to me that Neat Video and Optical Flow don't play together very well, because it leaves more noticeable noise and dust / scratches behind than without the Optical Flow. You need to run Neat Video BEFORE any in-FCPX framerate change. This also means you'll want to feed the originals to FCPX already in 24, 30 or any standard framerate - and definitely not 20. Then, no additional frames will be added. After running Neat Video, reimport the now-cleaned footage and, now, you can increase the framerate to for example 60p to make the movement more fluid. Now, albeit the dirt etc. will also "spread over" several frames, the overall effect will still be much better than doing the opposite (running Neat Video on already-Visual Flow'ed footage). BTW, back to the matter of the differences in the aging of different film material. Above, I've explained Kodachrome, very old Agfa and OR-WO age without problems, unlike newer Agfa (at least the stock manufactured starting in the '70s) and some other brands. I now also have first-person experience with Fujifilm Safety Film with the edge codes '7 59' very close to 'Fujifilm Safety Film' and, separately and much farther away, '23'. These definitely aren’t Fuji’s own date codes (see http://www.brianpritchard.com/Date%20Codes.htm ) - after all, in 1959 (assuming ‘59’ stands for 1959), Super8 didn’t even exist. Also note that Fuji’s film list at http://www.fujifilm.com/products/motion_picture/discontinued/pdf/fujifilm_motion_picture_film_manual.pdf doesn’t even list 8mm material, only 16 and 35. The colors are OK and there's no really significant color shift in the appr. 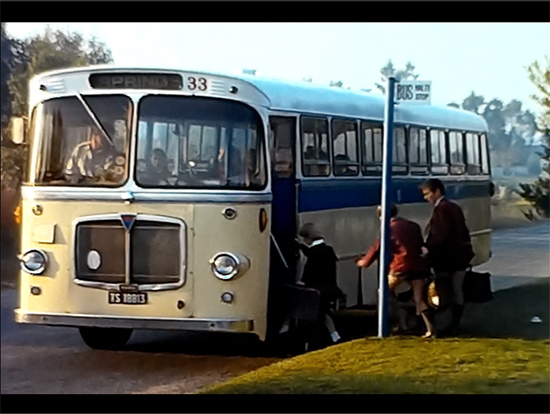 41...43-year-old films (showing the German town Bremen) I've scanned and uploaded to YouTube: https://youtu.be/prn324LBI8w (original, overscanned 18p) / https://youtu.be/DTPkF5c9oto (Motion Flow-processed 60p). I, not having a 16mm scanner, still haven't got it in a scanned format. I've, however, made some still scans of all the scenes in the film; with scenes depicting not only family life, more frequently. These scans also show how the colors have survived during all those 76-77 years. A very small section of the spool is shot on b/w (Kodak) film. As usual with films of that age (also see my 1955-1956 East-German film scans), it exhibits far better resolution than the color footage. I've, in addition to the auto-named image files, also added some filename postfixes for new and interesting scenes; for example, "3-PICT0033 - Helsinki from ship STARTS HERE" ( here ) on page 2 ( here ) etc. The first page of the album is at here . Note that the first around 120 images are strictly (not particularly interesting) family images; sights only start later. Also note that, while it was shot during WW2, there isn't anything related to the ongoing war anywhere - it was shot way away from the front lines. Just FIY, on the wolverine thread we are exploring ways to extract the JPG and raw video files before they are compressed into MP4 to reduce the artefacts. 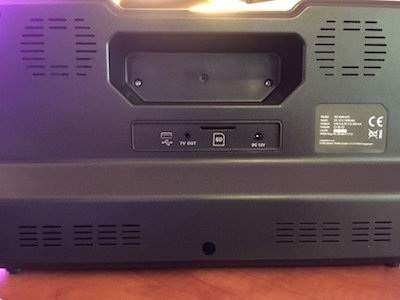 I have a question for Berend De Meyer (however if anyone else can help me , i would be thankful) - he posted photos with ventilation holes on the back of the device (im reposting photo below). we any information about an updated version from the manufacturer. Now my quesiton is - where have you bought the device with ventilation, as i have lots of films to scan and from the forum i understood that overheating is one of the engineering bugs to concern, so would like to buy an updated version. Trying still to reduce the noise/compression artefacts. Anyone had any luck with settings? or exporting the single frames? Dino did you try the Neat video plugin? Berend De Meyer posted about it above. It looks like it really does a good job of "hiding" the artifacts. Being a purist, that's still not a true solution to me (because those artifacts permanently reduce resolution and fine detail that would otherwise be captured), but I think we have to live with it for now. There's nothing else on the market (that's affordable for home users, anyway) that will do frame-by-frame captures of regular 8mm, so I've had to bite my tongue and be happy that at least I'm able to share memories from long ago with family and friends far and wide. The movies from the Wolverine look perfectly fine to most people. It's just we unfortunate souls with high expectations that can't help but see the flaws. The technology exists today to scan 8mm/Super-8 in 5K res, in HDR to get detailed shadows and highlights, with optical frame stabilization to align all the frames, in a codec that captures enough detail in the chroma to do good color correction. It's just not available in home devices yet. The Wolverine/Somikon get us some distance toward that goal (just having frame-by-frame is a vast improvement over older telecine methods), but there's a long way to go to get truly archive-worthy captures. 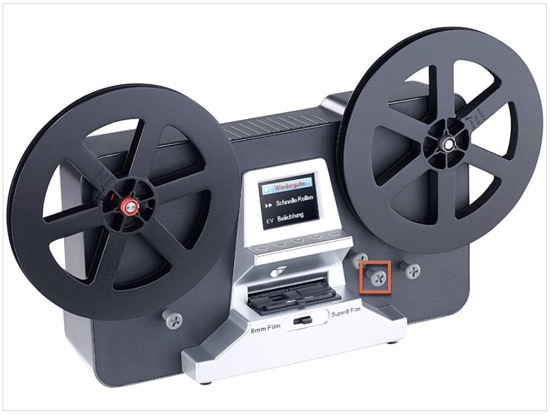 I hope that technology becomes affordable eventually, because I will absolutely scan all my reels again to get all the quality present in those frames. Meanwhile, my family and I are enjoying walking down memory lane and looking at films that hadn't been seen for 30-40 years. I've scanned and uploaded to YouTube: https://youtu.be/prn324LBI8w (original, overscanned 18p) / https://youtu.be/DTPkF5c9oto (Motion Flow-processed 60p). Hi Wegner, I am sorry for my ignorance, but what does 18p vs 60p mean? and which one produces better image? 18p = the original filming speed,thus the exact 1:1 film scan. 60p = the original 18fps "interpolated" to 60/59.94 fps,to smooth out the jerkiness in the original footage due to the low framerate. Thanks Nantawat, but at the 18p on the youtube link above, my eyes can see the speed is faster. I feel it is not like my home movies played on my projector at 18 fps. You can check on 0:26-0:31. The body's move of the gentleman with blue shirt and tie is not natural to me. Is it my eyes or it is actually not 18 fps as in projector? Just unpacked my Somikon - not using the mounts for the film - using the free reel and bin on the floor method - and outputting to a decent 9" Sony Pro monitor form the 80's - all very nice - done over 5000' in the last few days - BUT, does anyone know how to set the date and time on this? I have to add, for the price - it's excellent!